You focus on the content. Engage, educate and drive results! 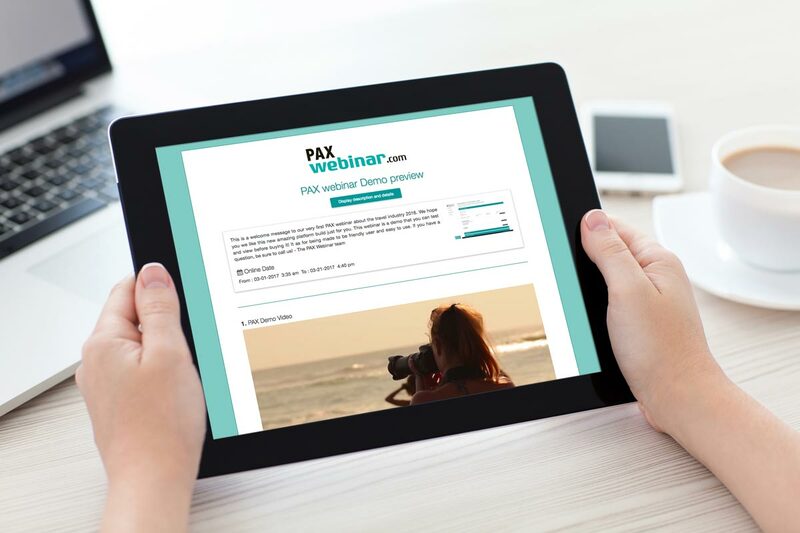 PAXwebinar.com, our bilingual Webinar tool, makes it easy to reach your travel trade audience and deliver customized interactive webinars that bring your products and destinations to life. All you need to do is tell your story! Display slides, stream videos, chat with participants and manage your webinar in a simple and seamless way! Communicate effectively with the travel agent community nation-wide in either English or French! Incorporate corporate logos and color scheme. Spread the word and increase webinar success! Reinforce your message and build affinity for your brand with these valuable Webinar features. Offer participants access to your webinar via phone, tablet, or computer. Receive 1 complimentary Quick Presse email distribution to promote your webinar PLUS webinar listing in the Resource section of either PAXnews, PAXnewsWest or PAXnouvelles! Chat with attendees and the host. Become expert sellers! Learn the latest supplier sales tips and marketing techniques. Unlimited number of users and questions!